The organisers of the disastrous Fyre Festival have been hit with a $100m (£78m) lawsuit by one of the attendees. The event was cancelled after squalid conditions were documented on social media. and performers did not turn up. American rapper Ja Rule, whose real name is Jeffrey Atkins, and his business partner Billy McFarland, are being sued for fraud, negligent representation and breach of contract. They have apologised and offered refunds to all the festival-goers. Attendee Daniel Jung, who has enlisted the services of celebrity trial lawyer Mark Geragos, is accusing the pair of "an outrageous failure to prepare". "The festival's lack of adequate food, water, shelter, and medical care created a dangerous and panicked situation among attendees - suddenly finding themselves stranded on a remote island without basic provisions - that was closer to The Hunger Games or Lord of the Flies than Coachella," the court filing said. "The Fyre Festival was nothing more than a get-rich-quick scam from the very beginning," it alleged. In a letter posted on its website over the weekend, Fyre organisers said "the team was overwhelmed". "They simply weren't ready for what happened next, or how big this thing would get," it said. 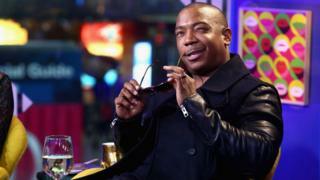 Ja Rule also posted on social media that he was "heartbroken", insisting the event was not a scam. "I truly apologise as this is not my fault... but I'm taking responsibility," he tweeted. The Fyre Festival marketed itself as a "once-in-a-lifetime" musical experience in the Bahamas with beach cabanas and gourmet cuisine. Tickets to the two-weekend event on Great Exuma Island in the Bahamas, cost from $1,200 to over $100,000. Up to 7,000 people were expected to attend. It launched on Instagram with a video featuring models Bella Hadid, Hailey Baldwin and Emily Ratajkowski sailing on a luxury yacht. But instead, festival-goers have complained about a "complete disaster" after many were stranded for hours without food, water or shelter. The court filing described their luggage as being "unceremoniously dumped from shipping containers and left for them to rifle through". The lawsuit also alleges Fyre's organisers warned musicians and celebrities not to attend the festival but "refused to warn attendees about the dangerous conditions awaiting them on the island". Blink-182, who were set to be headlining, pulled out on Thursday. Major Lazer, Skepta and Disclosure were also set to perform.